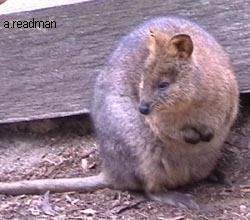 Found plentifully on Rottnest Island off Perth Western Australia, the current population on the island is estimated to be 10,000. 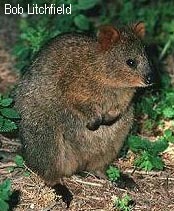 The Quokka is a small marsupial and looks like a Wallaby or Kangaroo. It's head is broad but short, with a dark stripe visible on the forehead. 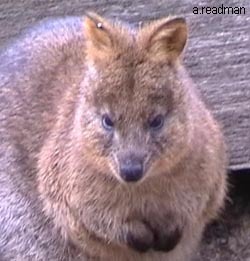 They have small, rounded ears covered by fur Its body has long thick shaggy fur normally coloured brown or grey flecked Its hind (Kangaroo like) feet are covered with stiff long hairs The tail is relatively short and is fairly smooth with little hair on it Quokkas sleep during the day. They live in a warm temperature climate in long grass or shrub land (semi arid heath) where they make pathways or runways for feeding and escape if disturbed. It feeds at night on native grasses and the leaves of shrubs. They need drinking water, but can survive long periods without it. 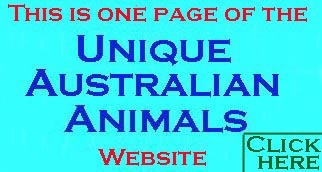 This is helped by the remarkable ability of the Quokka to reuse a portion of their bodies waste products. 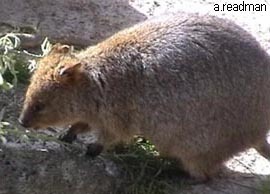 On the mainland, breeding is continuous but on Rottnest Island mating occurs from January to March. After a pregnancy of around 4 weeks a single young (Joey) is born. 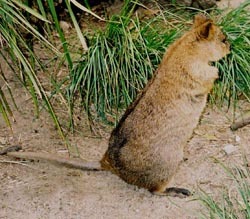 The joey lives in its mothers pouch suckling at one of its mothers 4 teats for the first 26 to 30 weeks. At this time it leaves the protection of the pouch but continues to suckle for another 8 to 10 weeks Males are larger than females. .